Celebrate International Migratory Bird Day with a stopover adventure on Lake Marion. 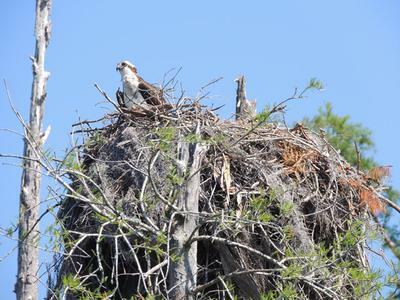 Explore a unique lake habitat including "Osprey Village" in the Stumphole Swamp on this two-hour boat excursion with Fisheagle Nature Adventures. Journey into the heart of this important migratory stopover site. Possible sightings include a multitude of migratory species including Mergansers, Wood Stork, Night-heron, Ibis, Kites, Flycatchers, Vireos and Warblers. • Tickets: $32 for current Center members; $40 per non-member (add a $10 donation and receive an annual membership to the Center); please note there is an additional $2 fee for parking at Santee State Park. All proceeds benefit the Avian Conservation Center/Center for Birds of Prey. For more information, please visit www.thecenterforbirdsofprey.org or call 843.971.7474.